At the end of September, from Tuesday 19 to Friday 22, PALU performed the first offshore flight tests of ANGELS System in Borkum Island, in northwestern Germany. With the support of a crew of the company Windpark Heliflight Consulting GmbH, ANGELS underwent a test flight in order to evaluate its performances in flight operations within an offshore environment and check the quality of the ADS-B signal. The test was performed with an EC-135 P2+ helicopter to Riffgat helideck, which is positioned inside an offshore windfarm. 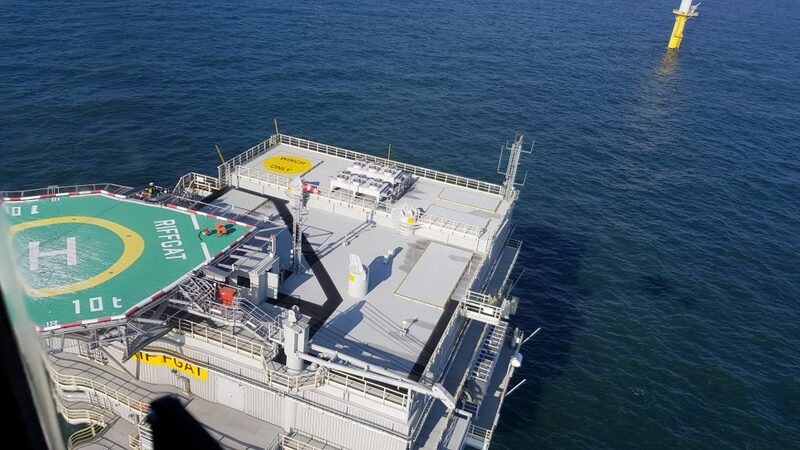 ANGELS ground station and hardware were shipped to the helideck few days before the test and were installed by personnel of EWE Offshore Service and Solutions GmbH, which is the operator of Riffgat Substation. An ADS-B receiver was put inside the helicopter with an external ADS-B antenna attached to helicopter skids in order to increase the quality of the communication signals. Tests were performed during the second day after the arrival of PALU team, at three different batches: the first one at 12:35, the second at 13:50 and the last one at 15:17, in order to confirm the sensitivity of the horizontal and vertical bar indication on the iPad display. The initial approach fix (IAF) was located at 1000ft MSL. During the second flight, a complete departure and approach was performed on the basis of the approved visual approach and departure procedure for night operations by the use of HAPI (Helicopter Approach Path Indicator). The test proved that the ANGELS System works properly and that the portable solution with an iPad in the helicopter is a suitable way to present the information to the pilot. Thank you Windpark Heliflight for your availability and support! On Tuesday September 5, in the afternoon, ANGELS System performed the final flight tests in Bresso City Airport, near Milano. With the support of Elite Aviation, a provider of helitaxi, tourist flight and flight school services, we set up the ground station and the helicopter antennae, checking data up- and downlink. The test was performed with a Robinson44 and followed a two-stage procedure, each stage lasting about twenty minutes; the procedure agreed with the pilot consisted in tracking the visual glide path with the aid of an iPad, during a flight over Milan along a trajectory that had been previously defined. It was an exciting and successful experience, and the system gave a brilliant performance. We would like to thank the team of Elite Aviation for willingness and support. L’articolo ANGELS FINAL TESTING sembra essere il primo su Advanced Next GEneration Landing System.